Malaria vaccines containing the Plasmodium falciparum Circumsporozoite protein repeat domain are undergoing human trials. There is no simple method to evaluate the effect of vaccine-induced responses on P. falciparum sporozoite infectivity. Unlike the rodent malaria Plasmodium berghei, P. falciparum sporozoites do not infect common laboratory animals and only develop in vitro in human hepatocyte cultures. We generated a recombinant P. berghei parasite bearing P. falciparum Circumsporozoite protein repeats. These hybrid sporozoites are fully infective in vivo and in vitro. Monoclonal and polyclonal Abs to P. falciparum repeats neutralize hybrid parasite infectivity, and mice immunized with a P. falciparum vaccine are protected against challenge with hybrid sporozoites. Pre-erythrocytic vaccines directed against Plasmodium falciparum Circumsporozoite protein (CS)6 (1) are undergoing trials in malaria naive and naturally infected individuals (2, 3, 4, 5). These vaccines aim to elicit high levels of Abs to the protective CS repeat epitope, as well as T cells to target the liver stages of the parasite. Immunization of volunteers in Africa and the USA with the CS-based RTS,S vaccine protected 50–70% of the vaccinees against infection for a very short period of time (3, 4). Although in all CS vaccine trials there was a correlation between the degree of protection and Ab titers to CS repeats (3, 5, 6), a role for cell-mediated immunity could not be excluded. Unfortunately, there is no simple laboratory method to evaluate the neutralizing capacity of Abs to P. falciparum sporozoites. These parasites do not infect common laboratory animals, and do not develop in hepatoma cell lines in vitro. Taking advantage of the easily quantifiable infectivity of rodent malaria Plasmodium berghei sporozoites, we constructed a recombinant P. berghei parasite expressing a hybrid P. berghei/P. falciparum CS, and used it to study the efficacy of a human pre-erythrocytic P. falciparum CS vaccine. The integration plasmid contains the P. berghei NK65 CS coding sequence and sufficient DNA 5′ and 3′ of the gene and, as a selectable marker, a variant form of human dihydrofolate reductase gene (hDHFR) that confers resistance to the antifolate drug WR99210 (7). Two unique restriction sites (SpeI and XhoI) were introduced by overlap PCR to flank the sequence of the CS repeat region (Fig. 1⇓A). The following oligonucleotides were used: PbXbaI, 5′-CCTCTAGATTAATAACTTGGGTTTTTGC-3′; PbSpeI, 5′-CTCCCGAAGGAACTAGTAAAAAAAATGAG-3′; PbSpeIR, 5′-CTCATTTTTTTTACTAGTTCCTTCGGGAG-3′; PbXhoI, 5′-CAAAAATAATAATAATCTCGAGGACGATTCTTATATC-3′; PbXhoIR, 5′-GATATAAGAATCGTCCTCGAGATTATTATTATTTTG-3′; PbEcoRIR, 5′-TTTTAGAATTCCCTTAAATAATATTGTAAAATAG-3′. The resulting fragment was used to exchange wild-type (wt) CS in the integration plasmid to give plasmid pCS(sx). The P. falciparum CS repeat region was amplified from genomic DNA from the 7G8 isolate (8) using primers that generated SpeI and XhoI sites: PfSpeI, 5′-GAGATGGAACTAGTAATAACGAAGACAACGAG-3′; PfXhoI, 5′-CTTGGTTCTTCCTCGAGGTTATTATTATTTTTTAC-3′. The CS repeat region within pCS(sx) was exchanged with the P. falciparum CS repeat region using the SpeI and XhoI restriction sites to give plasmid pCS(Pf). Both plasmids were confirmed by sequencing. Parasite transfection was performed as described previously (7, 9). Hybrid parasites were selected in Sprague Dawley rats (The Jackson Laboratory, Bar Harbor, ME) by i.p. injections with 5 mg kg−1 body weight WR99210 (Jacobus Pharmaceuticals, Princeton, NJ) on days 1–3. Southern blots of genomic DNA digested with HindIII/XhoI or PacI were probed with internal CS SpeI-XhoI fragments from pCS(sx) and pCS(Pf), and a BamHI internal fragment of hDHFR. Probes were labeled using a digoxigenin-ddUTP random priming kit and ECL was detected as described by manufacturer (Roche, Indianapolis, IN). Gene targeting strategy and generation of recombinant P. berghei parasites. A, CS repeat region sequences of wt P. berghei, CS(sx), and CS(Pf). The introduced restriction enzyme sites are underlined. B, Generation of CS(sx) and CS(Pf) in P. berghei CS− strain through a single crossover event targeted to the homologous 5′ untranslated region of the genomic CS− locus using integration constructs linearized at unique KpnI site. The predicted integration is shown with genes symbolized by boxes; thin lines indicate 5′ and 3′ untranslated region of CS; thick lines, plasmid vector sequences. Sizes of restriction fragments are indicated in kilobase. H3, HindIII; P, PacI; K, KpnI; S, SpeI; X, XhoI. C, Southern blot hybridization of genomic DNA of wt, hybrid or CS− parasites, digested with either HindIII/XhoI or PacI, probed for P. berghei CS repeat, P. falciparum CS repeat, and hDHFR . Parasite cycles were maintained by allowing Anopheles stephensi mosquitoes to feed on SW mice (The Jackson Laboratory) infected by sporozoites or blood stages of Pb(sx) or CS(Pf) parasites. The qualitative and quantitative development of wt and hybrid parasites were analyzed as previously described (7). CS expression on salivary gland sporozoites dissected 18–20 days post blood meal was assayed by immunofluorescence (IF) and Western Blot using mAb 2A10, specific for P. falciparum CS repeats (10) or mAb 3D11, specific for P. berghei repeats (11). Sporozoite motility was determined by gliding assay (12). Sporozoite in vitro infectivity was assayed in HepG2 hepatoma cells (American Type Culture Collection (ATCC), Manassas, VA) by counting exoerythrocytic form (EEF) at 20–24 h postinvasion in wells stained for IF using mAb 4C9, specific for malaria heat shock protein 70 (13). Sporozoite infectivity in vivo was assayed using real-time PCR to measure liver stage parasite 18S rRNA at 40–42 h after exposure of mice to infected mosquitoes (14). In vitro neutralization assays were conducted by adding 10-fold dilutions of mAb 2A10 or mAb 3D11 to HepG2 cultures 1 h before addition of sporozoites. Percentage of inhibition was calculated by comparing the number of EEF in cultures with or without Ab at 20–24 h postinfection. Ab-mediated neutralization in vivo was determined by i.v. injection of 100 μg of mAb 3D11 or mAb 2A10 into groups of three C57BL/6 mice. After 30 min, mice were challenged by exposure to 8–18 infective bites of CS(Pf)- or CS(sx)-infected mosquitoes. The presence of parasite rRNA in the liver was determined by real-time PCR. A (T1B)4 MAP vaccine, recently tested in phase I trials (15), was used to immunize C57BL/10 (The Jackson Laboratory). Mice were challenged 2 wk after the third s.c. injection of 50 μg MAP formulated with 10 μg QS21, a purified saponin adjuvant. Anti-repeat ELISA titers at the time of challenge were 6 × 105 geometric mean titer. In passive transfer experiments, 250 μl of immune sera obtained from MAP-immunized mice was injected i.v. 1 h before challenge by infected mosquitoes. Anti-repeat Ab levels in the recipients was 81,920 geometric mean titer. For CD4+ T cell depletion, 250 μg of anti-CD4 Ab (mAb GK 1.5; ATCC) was injected i.p. on days −4, −3, and −2 before challenge on day 0 by infected mosquitoes. 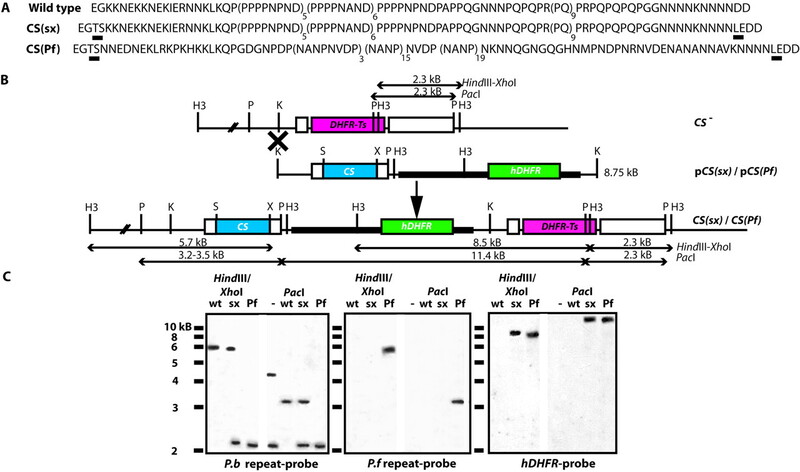 The P. berghei CS knockout (CS−) locus (9) was targeted with the two plasmids containing P. berghei CS with either wt (CS(sx)) or P. falciparum (CS(Pf)) repeat region sequences (Fig. 1⇑, A and B). Southern blot analysis of DNA from blood of CS(Pf)- or CS(sx)-infected rats confirmed that in each transgenic clone a single copy of the construct had integrated on the chromosome (Fig. 1⇑C). The development of the CS− parasite is arrested in the mosquito at the oocyst stage (9). In contrast, CS(sx) and CS(Pf) parasites were found in oocysts and salivary glands in A. stephensi mosquitoes (Table I⇓). Therefore, the introduction of the recombinant P. berghei CS complemented the CS− phenotype. There were no significant differences in infectivity of recombinant or wt parasites, as determined by percentage of midgut infections and mean number of oocysts per mosquito. However, we noted a reduction in CS(Pf) salivary gland infectivity and in the number of sporozoites per salivary gland. The expression of CS protein was demonstrated using Abs specific for P. falciparum (mAb 2A10) and P. berghei (mAb 3D11) repeats. The hybrid CS(Pf) sporozoites reacted only with mAb 2A10 in both IF and Western blot, while staining of CS(sx) and wt sporozoites was obtained only with mAb 3D11 (data not shown). 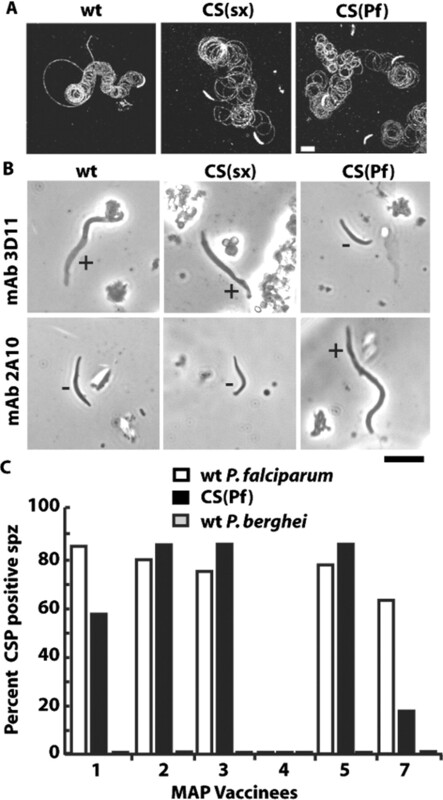 The circular pattern and number of CS trails deposited by the gliding parasites revealed no obvious differences in motility of recombinant and wt sporozoites (Fig. 2⇓A). Expression of CS protein in viable sporozoites as detected by (A) CS trails deposited by sporozoites gliding on glass slides, revealed by staining with biotinylated mAb 3D11 or mAb 2A10 and FITC avidin. Scale bars 10 μm. B, CSP reactions following incubation with mAb 3D11 or 2A10. CSP positive (+) and negative (−) sporozoites are shown. Scale bar 10 μm; C, percentage of sporozoites (spz) with positive CSP reactions following incubation in sera from P. falciparum (T1B)4 MAP vaccineees is shown on y-axis. Numbers on the x-axis correspond to individual MAP vaccinees, previously described (15 ). When cross-linked by anti-repeat Abs, CS protein is shed as a long precipitate at the posterior end of the parasite, termed the circumsporozoite precipitin (CSP) reaction (16). The CS(Pf) sporozoites gave positive CSP reactions when incubated with mAb 2A10, but not mAb 3D11 (Fig. 2⇑B). Conversely, the CS(sx) and wt parasites developed CSP reactions only when incubated with mAb 3D11. Strong CSP reactions were also obtained when CS(Pf) sporozoites were incubated with sera from human volunteers immunized with a P. falciparum repeat peptide vaccine, (T1B)4 MAP (Fig. 2⇑C). Reactivity of human immune sera with CS(Pf) sporozoites was comparable to that observed with viable P. falciparum sporozoites (15). The CSP reactions were specific, as the immune serum did not react with wt parasites (Fig. 2⇑C) or CS(sx) sporozoites (data not shown). Serum of a seronegative vaccinee (volunteer 4) and normal human serum did not react with CS(Pf) sporozoites. The CS(Pf) and CS(sx) sporozoites were found to invade and develop within HepG2 cells comparable to wt sporozoites (Table II⇓). The addition of mAb 2A10 inhibited CS(Pf) invasion of hepatoma cells in a dose-dependent manner, but had no effect on infectivity of CS(sx) or wt sporozoites. mAb 3D11 specifically inhibited CS(sx) and wt sporozoite infectivity, but not CS(Pf). To determine whether anti-repeat Abs could inhibit hybrid CS(Pf) sporozoites in vivo, mice were injected with mAb 3D11 or mAb 2A10 and challenged by exposure to infected mosquitoes. The passive transfer of mAb 2A10 eliminated 90–95% of the CS(Pf) hybrid parasites, while having no inhibitory effect on CS(sx) sporozoite infectivity (Fig. 3⇓A). Similarly, mAb 3D11 totally inhibited development of CS(sx) parasites, but not CS(Pf), in vivo. EEF development in mice exposed to CS(Pf)- or CS(sx)-infected mosquitoes following A, passive transfer of mAb 2A10 or mAb 3D11; B, immunization with P. falciparum (T1B)4 MAP; C, passive transfer of immune serum from MAP-immunized mice; D, CD4+ T depletion before challenge. Results are shown as the number of P. berghei 18S rRNA copies in liver extracts obtained 40–42 h post challenge. Each bar represents duplicate samples from an individual mouse. We also examined the potential usefulness of hybrid CS(Pf) parasites for measuring protective efficacy of P. falciparum CS vaccines. In recent Phase I trials, the (T1B)4 MAP vaccine elicited the highest peptide-induced anti-P. falciparum repeat Ab titers obtained to date (15). To assess the efficacy of high levels of MAP-induced anti-repeat Abs in vivo, C57BL mice were immunized with this vaccine and challenged by exposure to CS(Pf)- or CS(sx)-infected mosquitoes. No liver stage parasites were detected in the MAP-immunized mice following CS(Pf) challenge (Fig. 3⇑B). Protection was specific for P. falciparum repeats as the immunized mice remained fully susceptible to CS(sx) parasites. Sterile immunity was also demonstrated by the total absence of blood stage parasites following CS(Pf) challenge of a second group of MAP-immunized mice (data not shown). C57BL mice can develop both repeat specific CD4+ T cells (17) as well as high Ab titers. To determine the mechanism of protection, we passively transferred sera from the MAP-immunized mice to naive recipients and challenged them with CS(Pf)-infected mosquitoes. All of the recipient mice were protected (Fig. 3⇑C). In contrast, depletion of CD4+ T cells before CS(Pf) challenge did not abrogate immune resistance of MAP-immunized mice (Fig. 3⇑D). CD4+ T cell-depleted, as well as intact, immunized mice remained fully susceptible to challenge by CS(sx)-infected mosquitoes (data not shown). This is the first demonstration that vaccine-induced polyclonal anti-P. falciparum CS repeat Abs alone are sufficient to protect against viable sporozoite challenge in vivo. Abs specific for CS repeats can protect against malaria by blocking sporozoite invasion of host hepatocytes (1). Because sporozoites remain in the blood circulation for a very short period of time, the effectiveness of anti-sporozoite Abs will increase in direct proportion to their concentration and affinity. This prediction is in agreement with the results obtained following challenge of volunteers immunized with CS subunit or irradiated sporozoite vaccines (4, 5, 6, 18, 19) in which there was a positive correlation with high Ab titer and protection. However, not all individuals with high Ab titers were protected and several protected individuals had low Ab titers, suggesting participation of CS-specific T cells in immune resistance. The lack of a simple assay to measure the neutralizing capacity of anti-P. falciparum repeat Abs has limited investigations of the protective roles of humoral and cellular immunity. To address this problem, we constructed a recombinant P. berghei parasite bearing P. falciparum CS repeats to provide a relatively simple tool to measure neutralizing power of anti-repeat Abs specific for P. falciparum CS. To construct this hybrid, we used a CS− parasite (9), since in the CS knockout functional sporozoites would form only if the hybrids complemented the mutant phenotype. It was predicted that hybrid parasites containing P. falciparum CS repeats would exhibit a wt P. berghei phenotype in the mosquito and rodent host, since the presence of distinct CS repeats in other malaria species does not affect sporozoite function or host specificity. Indeed, the infectivity in vitro and in vivo of CS(sx) and CS(Pf) hybrids was very similar to that of wt sporozoites. The surface expression of wt and hybrid CS, as measured by CSP reaction and gliding motility, were also indistinguishable. However, following multiple mosquito passages, CS(Pf) salivary gland infections were lower compared with wt and CS(sx). This may reflect an intrinsic property of the single CS(Pf) clone we obtained. Our studies in the (T1B)4 MAP-immunized mice suggest that CS(Pf) parasites can be used to screen the potential efficacy of P. falciparum vaccine candidates before clinical trials. Significantly, the P. falciparum MAP-immunized mice were totally protected against challenge with CS(Pf) sporozoites and passive transfer of immune sera from these mice protected naive recipients. Although peptide-induced CD4+ T cells specific for CS can protect against rodent malaria (20), depletion of CD4+ T cells from the MAP-immunized mice did not affect immune resistance. CD8+ CTL epitopes have not been identified in CS repeats. Thus, protection elicited by the P. falciparum MAP vaccine was predominantly Ab mediated. Similar analysis of falciparum vaccines using hybrid parasites and HLA transgenic mice, which have proved useful as humanized models of disease and immunity (21) should also be informative. The CS(Pf) parasite may have other useful applications. For example, the presence of “nonrepeat” Abs in sera of vaccinees and naturally infected individuals may be revealed by large discrepancies between IF titers obtained using CS(Pf) as compared with wt P. falciparum sporozoites. These Abs and their function have been difficult to demonstrate using peptide or recombinant protein ELISA (6, 22), possibly due to the inability of these Ags to reproduce the structural conformations of nonrepeat regions in the native protein. The construction of additional hybrids expressing specific regions of the C terminus of P. falciparum CS, which contains the majority of T cell epitopes (20), would facilitate analysis of cellular immunity. The protective role of P. falciparum CD4+ T cell epitopes or CD8+ CTL epitopes, for example, could then be determined by challenge of vaccinated mice. The rodent hybrid parasite model is particularly advantageous for investigations of cellular immune mechanisms in liver and secondary lymphoid organs, studies which are not feasible in human or simian hosts. Importantly, the CS(Pf) hybrids are antigenically P. falciparum, but they are functionally a rodent malaria, and thus are not a biohazard. CS(Pf) parasites provide a safe, readily available tool for analysis of immune responses to P. falciparum elicited by vaccination or natural infections. We thank R. Altszuler and I. Caro for technical assistance, O. Bruna-Romero, P. Sinnis, and V. Thathy for advice, and M. Francis for critical review of the manuscript. ↵1 This work was supported by National Institutes of Health Grants AI 45138 and AI 2508 (to E.N.) and AI 47102 (to V.N. ), a United Nations Development Program/World Bank/World Health Organization Special Program for Research and Training in Tropical Diseases grant, and a Wenner-Gren Foundations fellowship (to C.P. ), a Howard Hughes Medical Institute Postdoctoral Fellowship for Physicians (to A.S.), and a fellowship from the Life Sciences Research Foundation (to P.B.). ↵2 C.P. and G.A.O. contributed equally to this study. ↵3 Current address: Department of Molecular Biology, Umeå University, SE-901 87 Umeå, Sweden. ↵4 Current address: Department of Immunology and Infectious Diseases, Harvard School of Public Health, Boston, MA 02115. ↵6 Abbreviations used in this paper: CS, Circumsporozoite protein; hDHFR, human dihydrofolate reductase gene; CS−, CS knockout; wt, wild type; CSP, Circumsporozoite precipitin; EEF, exoerythrocytic form; IF, immunofluorescence; MAP, multiple Ag peptide.